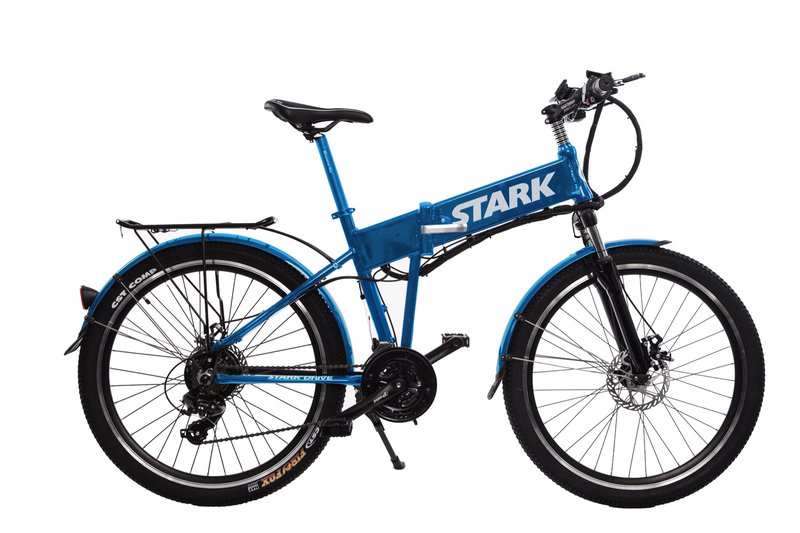 The most affordable, complete electric bike ever starting at $399! Designed for all types of weather conditions. From the beginning we are offering your choice of White or Matte Black and for those that want a bit more exclusivity a limited edition Metallic Blue will be offered on our best equipped Stark Drive. 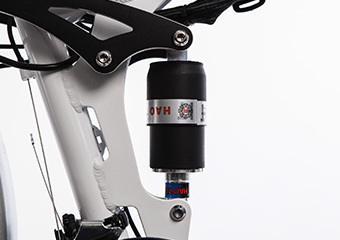 Front suspension by default with the option of rear suspension and various motor sizes depending on the rider. 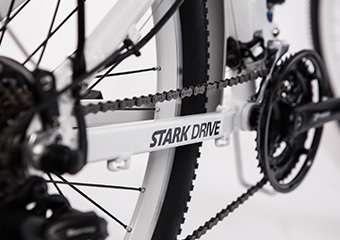 21 Speed Gearing System included with all units of Stark Drive. We have included the best all terrain bike tires we could find. 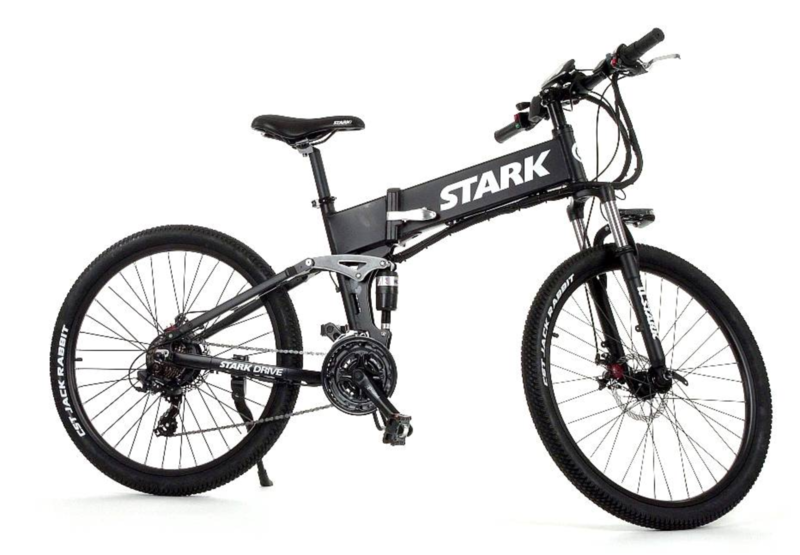 You can choose to charge the battery within the bike or remove the battery and charge it at work or at home. 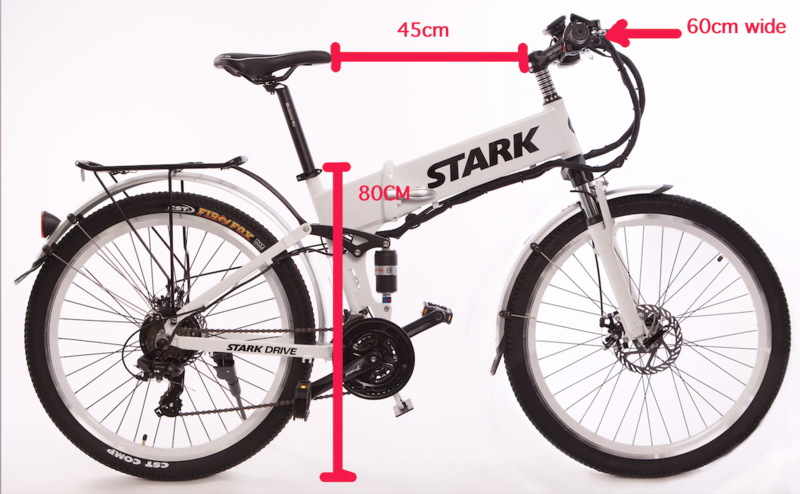 We also designed the bike to hide this battery and its power distribution system neatly inside the frame making the bike look just like a normal bike. 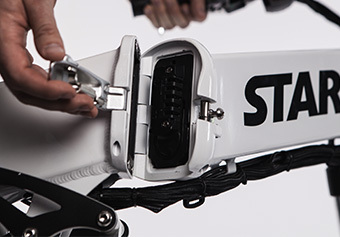 It includes a locking mechanism that ensures no one can remove the battery without your uniquely produced key. 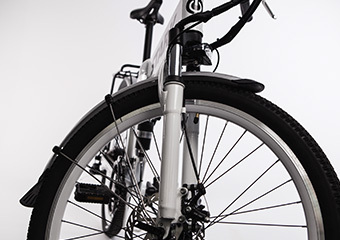 You can choose to charge the battery within the bike or remove it and charge it at work or at home. We will offer both a quick charger as well as standard charger with Stark Drive (2 or 4 hours charge time respectively). 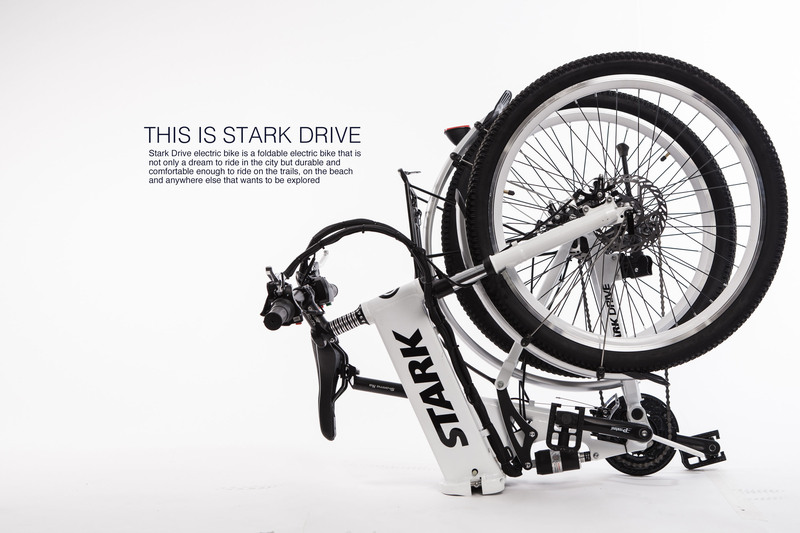 Stark Drive has chosen not to 'reinvent the wheel' (no pun intended) so we went with an existing frame design built on readily available moulds in order to reduce the cost of tooling and manufacturing. We have chosen the best components designed to work in harmony with one another while keeping total cost at the forefront of our design goals. 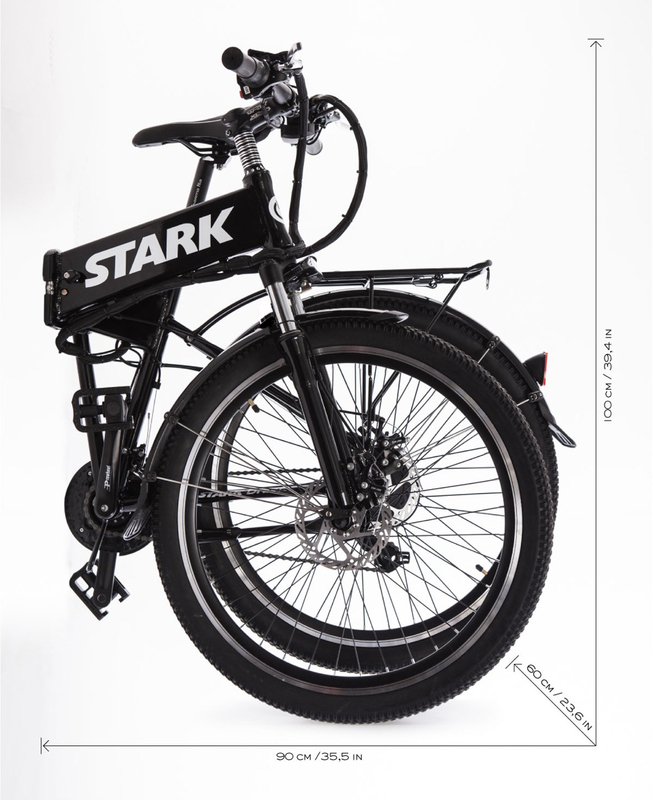 The result is the most affordable electric bike in the world, bar none. 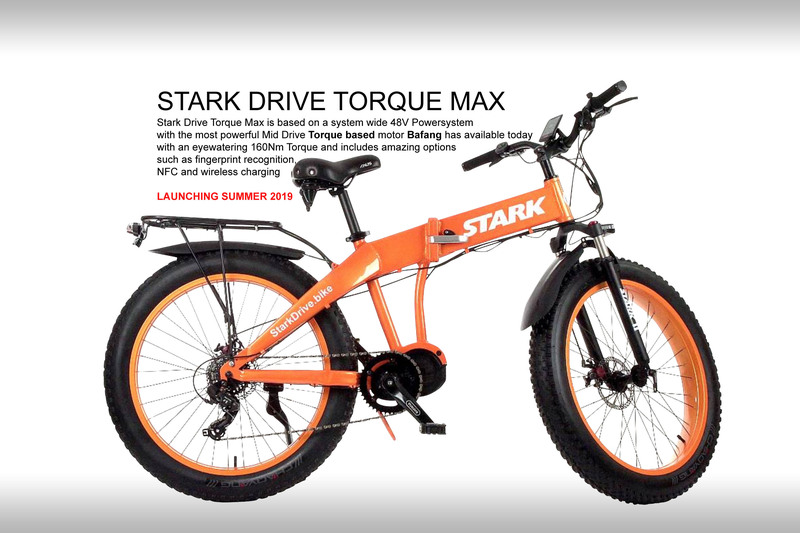 Take a look at Stark Drive and the many customization opportunities that we offer as we believe that the perfect electric bike is the one that matches our customers needs. Batch 2 USA/Canada Update (Backers from June 6 to December 14 2017). we have recently reworked our configuration page so that both throtle and cruise control are combined and with the throttle you can choose if you want to pedal or just move quickly up to speed without needing to pedal whatsoever. 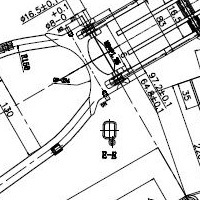 This is especially useful when you are trying to move uphill from a standstill. 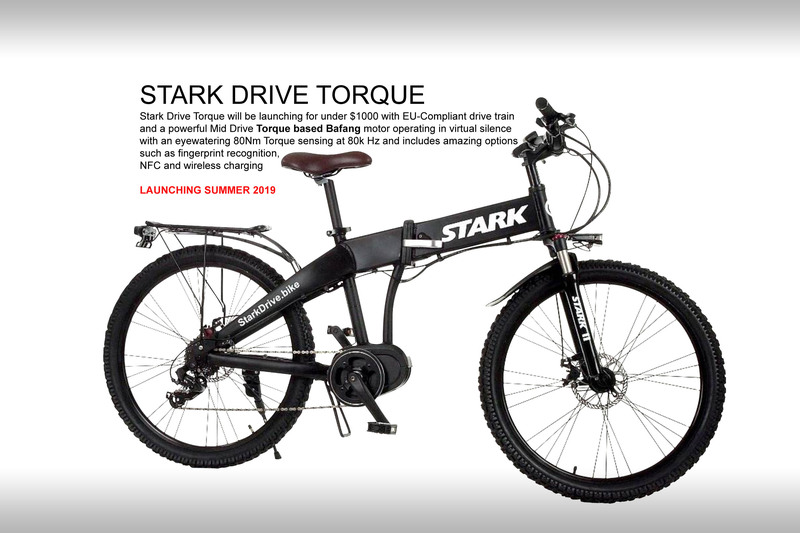 Stark Drive currently uses a Cadence Sensor but we are going to be launching a Torque Sensor Model via crowdfunding in 2019. But what is the difference between Torque and Cadence sensors? 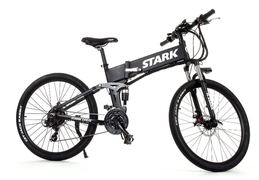 The advantage it is an inexpensive way to get some sort of pedal assist onto the bike, but the disadvantage is that the pedal assistance can feel jerky, laggy and counterintuitive. Most all higher end bikes use torque sensors. The disadvantage is the cost is significantly higher to implement this technology. When do you plan to deliver? Our manufacturing partner and Stark Drive LLC have a frame agreement signed and they are ready to produce as soon as we transfer funds. We update our blog regularly and there you will find the latest information about factory production. Check there first.